No marine mammal is safe when it comes to protecting the rights of commercial fisherman and anglers. Oregon and Washington are not about to give up even 1% of the salmon they harvest each year even if it means killing sea lions. Thanks to a court ruling National Marine Fisheries Service (NMFS) is using lethal force to stop the Columbia River Sea Lions from taking salmon at the Bonneville dam where salmon struggle each year to make it through the man-made fish ladders. Any sea lion that visits the Bonneville dam more than twice will be killed or sent to marine parks such as Sea World to live their lives in captivity giving marine parks and aquariums a new source of display animals. 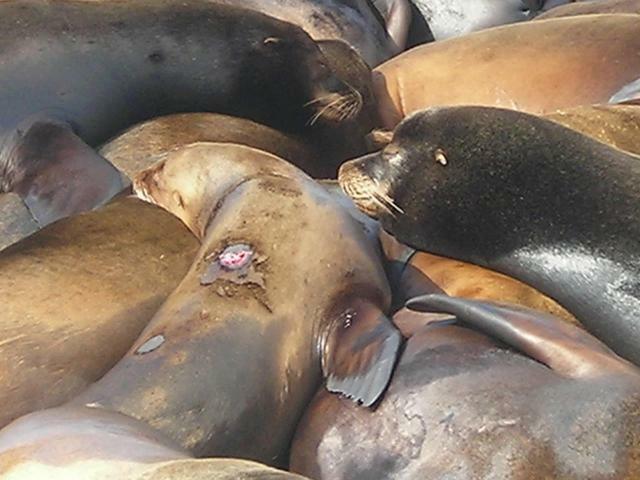 At the Port of Astoria panicked sea lions packed into a floated cage are branded with a hot iron one by one. The Human Society makes some very good points as to why the salmon are not recovering. Sadly, again we find the work of human beings as reasons causing the collapse of salmon not the sea lions. The plan to shoot sea lions coincides with estimates that this spring’s Columbia River salmon run is likely to be the among the fourth largest since 1980 while, as of the date of lethal removal authorization, only two California sea lions had been seen at the dam, the fewest to date of any year since 2003 and the time each animal spends at the dam has been steadily declining over the past few years. Dams: NMFS estimates the Federal Columbia River Power System kills 16.8 percent of adult Snake River Basin Steelhead and 59.9 percent of juveniles. *Hatcheries: In 2009, a Congressionally mandated science panel found that current fish hatchery practices interfere with recovery and are in urgent need of reform. *Fishing: The states annually authorize the incidental take of between 5.5 and 17 percent of the Upper Columbia spring Chinook and Upper Snake River spring/summer Chinook. Additional salmon are killed in ocean fisheries. Employment of selective gear would permit wild, ESA-listed salmon and steelhead to be released unharmed when caught in the Columbia River fisheries that target abundant hatchery fish. Palm Sunday for some is supposed to be a peaceful holiday. We woke to the sounds of sea lion screams coming from Pier 36. We scrambled to get dressed, get our equipment, and get down to the docks. We were astounded by the sight of 30 + beautiful sea lions, in sheer terror, climbing upon each other and crying out in fear. Trying to escape their human captors. 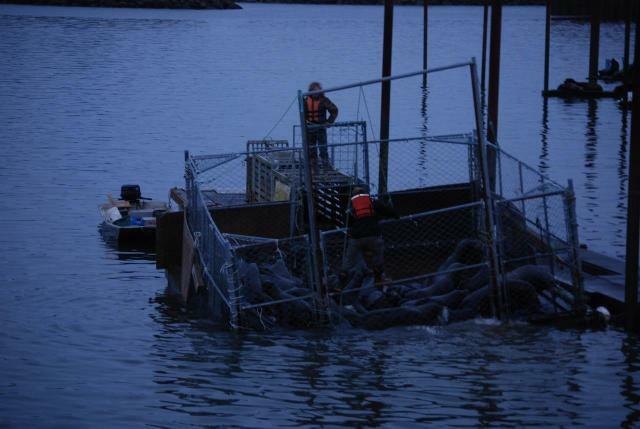 Sea Lions literally filled the trap, and the weight was causing the cage to sink. The sea lions sitting on the docks were also upset. Little ones were swimming up to see their friends in the trap. A woman was screaming “Don’t hurt the babies, Matt, how do you sleep at night?” We talked to tourists who heard the sea lions and this woman screaming. They flocked to the pier, and walked away with the truth about what is happening to our oceans, and to marine wildlife on The Willamette and Columbia River. I noticed they would come with smiles on their faces and left looking disturbed. With horror and tears on their faces. Visit the website Sea Shepherds Dam Guardians and find out how you can join the campaign to save the sea lions. Please join the event on Facebook Rock The #DamTweet For Sea Lions! There you will find many ways to take action so that you too can help to stop this terrible injustice to sea lions. 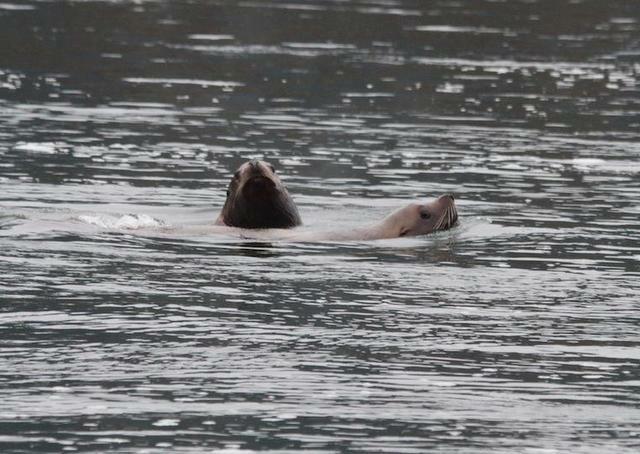 Killing Sea Lions below the Bonneville Dam on the Columbia river is not the answer. You may ask what has changed since 1972 that would allow tossing out a part of the Marine Mammal Protection Act in exchange for brutal force. Federal protection as often is the case; can enable a decimated species to regenerate it’s populations and eventually flourish. 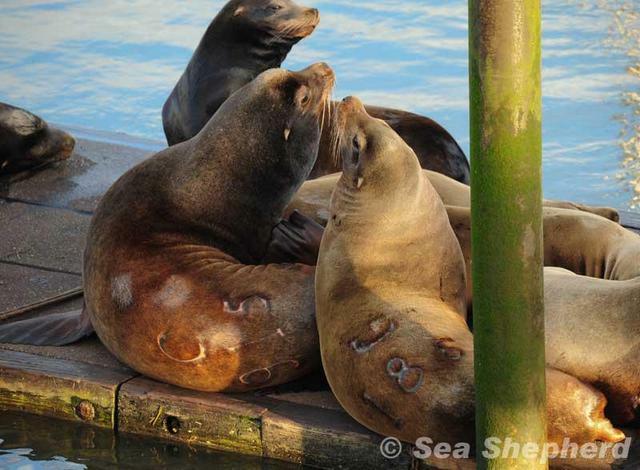 Thanks to federal protection the number of sea lions has increased. In the 1920’s seal lion populations off the west coast were decimated to a population in the thousands, due to fur harvesting. Today the sea lions numbers have increased to almost three-hundred-thousand thanks to conservation efforts and federal protection. Unlike the California seal lion whose populations have recovered, the Alaskan sea lions numbers have continued to decrease. Several factors seem contributing to their demise due to the over fishing of two species, cod and mackerel. In that situation, National Oceanic Atmospheric Administration (NOAA) has proposed very restricted fisheries to helping the Alaskan sea-lion populations to recover. Some suggest that killer whales are the culprits as their diet now includes sea lions because the whale populations are so depleted. I mention over fishing and the plight of the Alaskan sea-lion because there are similarities. Could over fishing on the West Coast be a factor driving the sea lions up the Columbia River?In essence we have dichotomies within nearly adjoining waters with the same agency NOAA and the Marine Mammal Protection Act (MMPA) in the cross hairs of controversy. I mentioned Sharon Young Marine Issues Field Director HS earlier. Included is her objective data and profound observations, to help convince any doubters of her arguments, and objections to the slaughter of the Columbia sea lions. If only the members of HSUS which number 23 million would come on board and bombard their Congressional representatives, this House resolution would quickly disappear. In the meantime I have reviewed her testimony and will high light significant points that she made before the subcommittee. She was a member of the pinniped (seals) task force which that made recommendations on salmon predation prevention. From the outset of her five-page rendering she made it clear that the problem of declining salmon runs had little to do with the sea lions and more to do with loss of habitat and poor management practices. Solidly grounded arguments made by Young demonstrated the impact of 1) hatchery fish, 2) the intentional introduction of non-native species, Walleye, and 3) fisheries both sport and commercial as mitigating and contributing factors to the slow recovery of salmon runs. She completely discounts the contention that the sea lions are an active threat to Columbia River salmon populations. Passage of HR 946 will not only allow “vigilante,” style killing of the sea lions, but will also undermine the Marine Mammal Protection Act of 1972. When looking at the mainstream media coverage of this hearing, agency folks made the mistake of trying to establish the presence of sea lions on the Columbia River as a recent occurrence rather than citing the truth, that the California sea lions were first observed by Lewis and Clark on their famed visit to the Pacific Northwest 200 years ago. At one time the sea lions terminal point for migration was Cello Falls, some 180 miles upstream. Indian fisheries at these sacred falls witnessed seal lions the Columbia river, and shared their catch with these fish hunters. 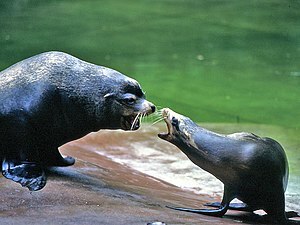 Today the journey of the sea lions ends at Bonneville dam, as it obstructs their natural migration. 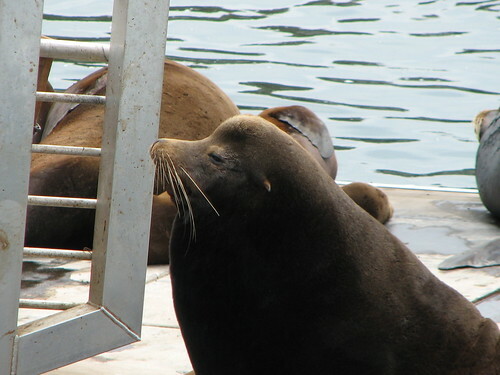 Young used information submitted by NOAA and the Army Corp of engineers to piece together data that validated her contention that sea lion consumption of salmon had not changed, and may have even declined on a percentage bases. The number of returning salmon has increased leaving the quota by the National Marine Fisheries Service (NMFs), “Overall abundance of Chinook and steelhead potentially impacted by pinniped predation [has] increased or stayed the same since the last status review was conducted prior to 2005.” Using their figures she denotes the percentage decline of predation over the last three years stating with 4.2 percent in 2007 when the states’ first applied to kill sea lions; in 2008, the predation rate was 2.9 percent of the run; in 2009, it was 2.4 percent of the run; and in 2010 it was only 2.2 percent of the run. 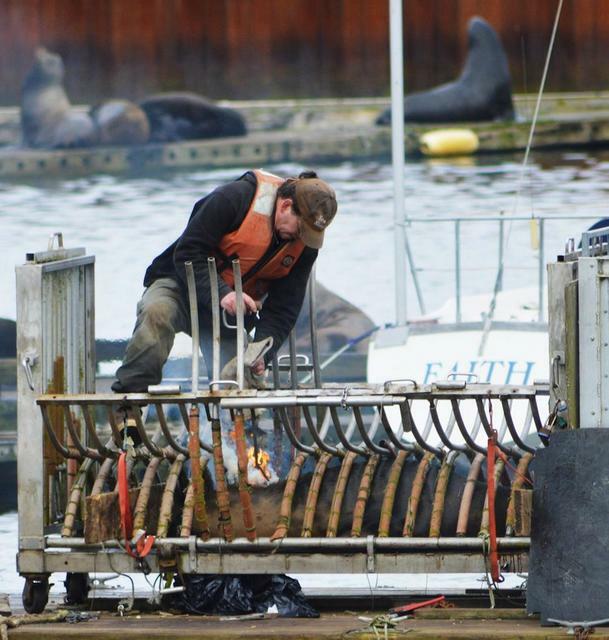 Preliminary wrap-up report for 2011 summarizing seal lion predation on the Columbia River, states that an estimated 1.4 percent of the run was consumed. The goal was to have been 1% and this year WITHOUT KILLING A SINGLE SEA LION THE GOAL WAS NEARLY ACHIEVED! On total numbers of fish consumed the government argues that the raw numbers have increased seven fold since 2000, when actually the percentage of the run consumed is the lowest since 2002. As you can see we are witnessing another shell game at the expense of a potential death sentence for long term river residents.